Non-Condensing and Condensing Economizer Systems, Waste Heat Boiler Systems, ThermoCharger Systems, Combined Heat and Power (CHP) Systems, Gas-to-Gas Heater Systems, Blowdown Heat Recovery Systems. 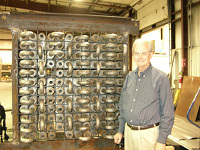 Tulsa Heaters Fired Heaters, Waste Heat Recovery Systems, Air Preheat Systems, Retrofits and Upgrades. See more heat exchange equipment manufacturers.